During 1956 and 1957 the new star tenor with the controversial Miles Davis Quintet, John Coltrane, racked up an impressive number of sideman appearances on sessions recorded at the legendary Van Gelder studios in New Jersey, taking his place in the rotating stock-company of players favoured by the Prestige and Blue Note labels. Released under various leaders’ names, and often derided by critics as mere “blowing sessions”, the albums resulting from these dates included several in which Coltrane went toe-to-toe with other tenor saxophonists, some older and better established – including on one memorable occasion none other than the father of jazz tenor himself, Coleman Hawkins – to those occupying roughly the same “rising star” turf as himself. Stylistically these recordings varied greatly, enabling Coltrane – the uber-modernist – to share a mic with players with very different musical aspirations, including the Lester Young-inspired Paul Quinichette, Count Basie-regular Frank Wess, Belgian jazz-migrant Bobby Jaspar and the alchemic ex-Woody Herman pairing of Al Cohn and Zoot Sims. Closer to his home, he also appeared alongside three musicians who were equal contenders for the Hard Bop tenor crown - Johnny Griffin, Hank Mobley and Sonny Rollins - famously meeting the latter on the magical one-off Tenor Madness, the ultimate heavyweight saxophone showdown. This new Acrobat release is the first to concentrate exclusively on these tenor sax-centred sessions, and alongside Coltrane and his saxophone-playing colleagues, the roll-call of jazz notables to be heard also includes trumpeters Donald Byrd, Lee Morgan and Idrees Sulieman, guitarist Kenny Burrell, pianists Red Garland, Elmo Hope and Mal Waldron and drummers Art Blakey, Philly Joe Jones, Art Taylor and Ed Thigpen. 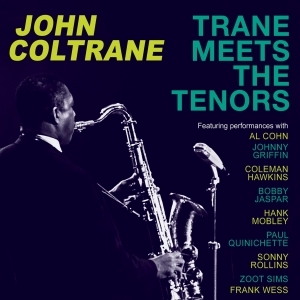 Hearing Coltrane together with so many other front-rank tenor talents not only highlights how distinctive he already was, even at this early juncture in his all-too-short career, it also provides an insight into how his innovations were woven into the overall fabric of the days modern jazz. The 4-CD set also comes with an extensive booklet essay by saxophonist and writer Simon Spillett.